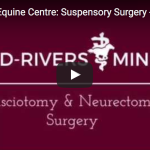 Mid-Rivers Equine Centre has a vast arsenal of diagnostic equipment at the hospital to investigate a horse’s injury or illness. With the explosion of technology, diagnostic equipment has become very sophisticated ensuring a quicker and more precise diagnosis. 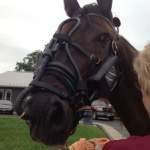 Mid-Rivers is dedicated to bringing you the latest diagnostics equipment to provide the best care for horse. Digital radiology has been one of the most incredible technological advances in the last twenty years. With digital radiology, it’s not just the system hardware that is important. Software allows us to manipulate the images and gain even greater clarity and diagnostic value. In other words, digital radiography offers the possibility to extract more information from the radiographic images we use compared to conventional film images. Dr. Rich Hartman Performing An Ultrasound. By performing an ultrasound scan on a horse, our doctors can visualize the deep structures of the body. This is done by recording the reflections of echoes or pulses of ultrasonic waves directed into the tissues. In the early years of this technology we used ultrasound as an aid in the breeding management of mares and early pregnancy diagnosis. 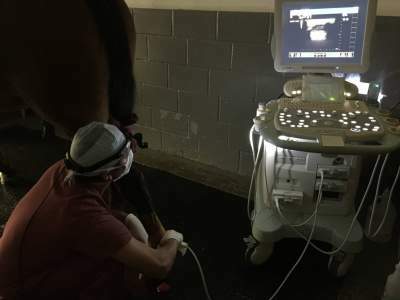 As the technology has advanced, we now use ultrasound extensively for lameness evaluation of soft tissue structures as well as fetal evaluations, cardiac imaging and it even is beneficial when evaluating the cause of colic. We currently have four ultrasounds and the most advanced of these is our Acuson 128 X P 10. This ultrasound can penetrate deep into the abdomen and is very useful in evaluating deeper structures plus it allows us to use Doppler technology that further clarifies the structures being evaluated. Ultrasound is a technique that is constantly being improved and refined and this technology truly allows us to have eyes that can see inside a patient. Dr. 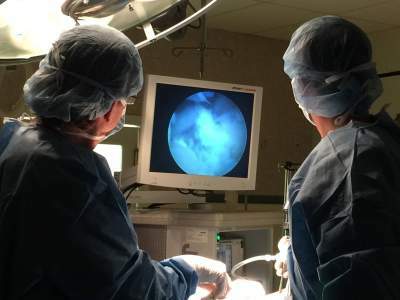 Dawn Hoover and Dr. Rich Hartman Using An Endoscope During Surgery. This is a minimally invasive diagnostic procedure used to evaluate the interior structures by inserting a small scope in the body, often but not necessarily through a natural body opening. Through the scope, one is able to see an image projected on a monitor. This allows everyone present to view the image as compared to older technologies wherein only the operator could view the image through the eyepiece. This medical instrument not only provides an image, but also enables taking small biopsies and retrieving foreign objects. Endoscopy is the vehicle for minimally invasive surgery. Many endoscopic procedures are relatively painless and only associated with mild discomfort. A three-meter endoscope has enough length to reach the stomach of most horses. Gastric ulceration has become a common issue with our horses and this instrument allows us to see and therefore treat more effectively. Endoscopy of the stomach requires the stomach be empty and we normally fast these patients for up to 24 hours prior to the procedure. When a horse is at rest, some conditions like soft palate displacement will not appear on a traditional endoscopy. Our dynamic endoscopy allows us to diagnose your horse in dynamic conditions (e.g., running or walking) rather than at rest. This is a form of endoscopy wherein a scope is introduced into joints for evaluation and allows surgical procedures to be performed through 2 or 3 very small incisions. Incisions so small they often require on 1 or 2 sutures for closure. This technology improves joint surgery dramatically and allows the healing time to be greatly decreased.